Until two years ago, she was a student of the Kenyatta University in Nairobi. She refuses to allow her age to be the main reason she cannot lead politically. 23-year-old Suzanne Silantoi Lengewa is an aspiring senator for the Kenyan capital, Nairobi. She is among the few young aspirants gunning for a senatorial seat as Kenyans vote in general elections on Tuesday, August 8. The choice of Nairobi for a young independent aspirant pits her against political heavyweights but Silantoi says she is unfazed and believes she can upset the odds. “As a person who believes that Nairobi deserves better, I should be gaining experience on the job, as a change maker, a trailblazer,” she said. She received the go-ahead to contest on May 29 but it wasn’t without incident. The need to submit 2000 voters unaffiliated to any party nearly crushed her dreams. She was about 500 names short. She left but was back in 5 hours with the full list. 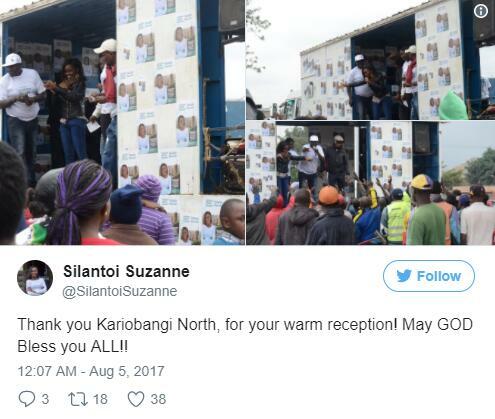 People outside the hall volunteered to help her scale the filing hurdle and with that she was passed to face bigwigs from the ruling Jubilee party (Johnson Sakaja) and main opposition Orange Democratic Movement (Edwin Sifuna). “I am right now where I ought to be, running to be Nairobi’s senator,” Ms Lengewa, a graduate in music told the Daily Nation news portal after receiving her clearance certificate. Despite her background in music, she works as as communication officer with a group known as Center for Behaviour Change Communications. Her work entails going around Nairobi and listening to challenges the ordinary Kenyan faces and helping with solutions. She fends off claims that she could wait and gain experience before entering politics. “I am developing my leadership abilities and hopefully, inspiring other young people to be the change they desire. Should I leave politics alone and be busy doing other things? No!” she told the Daily Nation in June this year. She posits that young people must learn to defy the status quo and get themselves involved in issues that affect their present and future. “Young people must hit when the iron is still hot. We must strive for an excellent county when we still have the energy to catalyze the excellence. “If we waited a moment more, if we developed our career in something else or settled down, we will wake up to realise we are too settled in our ways to change,” she added. She admits campaigning has not been easy for a number of reasons. Her inability to give bribes, her age pops up and at some point too her gender is attacked. “I don’t give bribes and that has at times infuriated some people, and I have had to run away from some of the campaign stops. “I have also been told that I am young and should consider dropping out… It comes mostly from young people on social media. “My age is a bigger barrier than my gender. People have a problem with how old I am. I get a lot more comments about it than I do condescending remarks about my gender,” she told the BBC. She, however, admits campaigning has been generally okay for her because people made time to listen to her. “I think because I come from a minority ethnic community people have been willing to hear me out,” she added. She is on record to have said the main parties had divided the people and she wanted to correct that anomaly.